At ultracold temperatures below 1 microkelvin, gases of atoms exhibit quantum phenomena on a macroscopic scale. Bose-Einstein condensates – the coldest matter in the Universe – consist of millions of atoms, all in the same quantum state. This new phase of matter is described by a macroscopic quantum wavefunction up to 1 mm in size. BECs are an exquisitely sensitive platform for exploring myriad physics: from condensed matter analogues to probing changes of fundamental constants, to making precise measurements of forces and fields. The quantum gases group at Monash explores topological defects in multicomponent superfluids, and precise control and measurement of quantum gases with magnetic order. Our state of the art laboratories occupy the ground floor of the New Horizons building. A research project in quantum gases is an opportunity sharpen your experience in areas including computer simulations, theoretical quantum physics, optics and imaging, electronics (wideband control, power, optoelectronics), laser design/construction, and experiment control software. We offer students experimental, theoretical, and hybrid research projects. 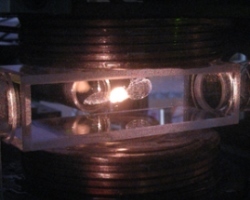 An ultracold cloud of 5 billion rubidium atoms at a temperature of 0.0003 K. The cloud is 1 cm across, and is being levitated by lasers in a vacuum one quadrillion times lower pressure than Earth's atmosphere. It is further cooled to 100 nK, where it undergoes a phase transition to a Bose-Einstein condensate, the coldest matter in the Universe.